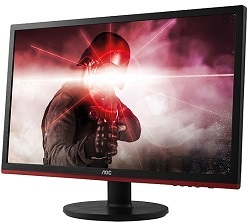 Featuring AMD FreeSync technology to eliminate tearing, stuttering and input lag, the 24-inch AOC G2460VQ6 also boasts a 1ms response time, a 75Hz refresh rate, and the innovative Anti-Blue Light technology, which reduces eye fatigue for a more comfortable viewing. AMD FreeSync enables a seamless synchronization of GPU and monitor refresh rates without sacrificing performance at an affordable price. This technology delivers a gaming experience with zero tearing,zero stuttering and zero input lag while keeping the frame rates at maximum level. AMD achieves this by utilizing the industry standard DisplayPort Adaptive-Sync to enable dynamic refresh rates. That means the GPU is communicating with the monitor simultaneously to sending a new frame or image, leading to a perfect synchronization between both devices. Gamers only need a compatible AMD Radeon graphics card, a FreeSync enabled AMD Catalyst driver, plus a supporting gaming monitor and they are equipped to enjoy the smoothest gaming ever experienced.